Map scale description: 3/4'' : 1 m.
This map was commissioned by the House of Commons for the 21st report of the Commissioners of Revenue Inquiry. It title features at top right, with its border divided in degrees of latitude and longitude. 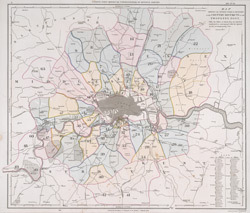 Rides and delivery walks in the Two-Penny Country Post are highlighted in colour and numbered for reference. A list of rides and key to delivery walks appears in a table at bottom right.